Call me naive, but I am not too fond of the notion of watermarking photos. It’s merely a problem with aesthetics, nothing intrinsic. Photos with huge watermarks on them make me want to gouge my eyes out — but that’s probably my problem only. This doesn’t mean I can deny the usefulness or the necessity of watermarks, especially in times when everybody assumes that, just because it’s available over the Internet, any photo is free for anybody to use without even giving credit to the photographer. Alas, watermarks are one of the few weapons still available to discourage dishonest Internet users to take advantage of your creations. Again, nothing wrong with it: after all, painters have been signing their artworks for a long time now and nobody has complained so far. Being able to watermark photos relying entirely on devices like iPhone/iPad is a concern of many users willing to protect their work, especially if intended for Internet sharing. Plum Amazing offers with their iWatermark a tool that will come in handy to anybody in need to put a signature or other recognizable mark on their photography, in order to prevent misuse and other unpleasant surprises. Share via email, Twitter, Facebook. In iWatermark, it’s possible to work with photos stored in the Camera Roll, but it is also possible to use the built-in camera. The user can both create a text watermark or use graphic elements to attach to the photo. 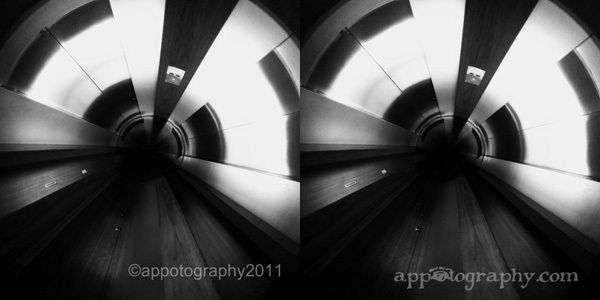 Using the app is quite easy for those who have some experience with more complex photo editing utilities. For others, using the app might require a little more effort, but a clear and extensive in-app guide was included to help beginners. Some of the most common fonts come with the app, providing a certain degree of customization. It’s not a rich collection perhaps, but to make up for this lack of variety, it’s possible to switch from text watermark to graphic watermark creation; the latter allows to import external graphics like transparent png files to be used as watermarks. In the case of text, it’s possible to change color, opacity, size and angle of the watermark both by pinching and rotating with your fingers on screen and by moving sliders knobs for each parameter; you have access to the same parameters also for graphic watermarks, apart from the color value. You can freely move the watermark to find the more convenient placement over the base image. In iWatermark you can also create QR (also known as Quick Response codes, bi-dimensional codes containing information of various nature) watermarks, which these days can be read by many scanning devices, Apple iPhone included — there are several apps to decode QR codes in the App Store too. One of the most interesting features of iWatermark, besides its full usability on multiple platforms, is the possibility to use your own graphics. 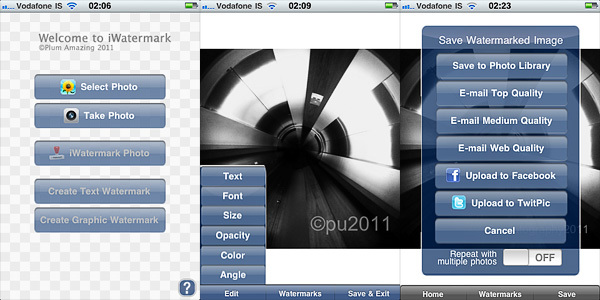 Several other apps offer text watermarking, more or less as iWatermark does. But not as many offer to import custom graphics that can easily be used as pre-made logos. What I would probably improve in this app is the selection of included fonts. Also, I would give the user the opportunity to disable the sample watermarks, which are many but frankly not very usable — who would want to attach a Tchaikovsky or a Mahatma Gandhi signature to their photos anyway? Or at least I would arrange the watermarks into separate lists, to access the custom watermarks more quickly. Overall, iWatermark is an app that I feel like recommending: it definitely makes watermarking more accessible, quick and less frustrating.